I love finding new and different ways to prepare pizza. This one has just the right amount of kick from the salsa and the pepper jack cheese. And since it's chicken, you don't have to feel quite as guilty...We love flatbreads and this one adapts nicely. You can use your favorite color of bell pepper - or use mini peppers for a beautiful combo! This would also make a great party appetizer - everything about this is so versatile. What's not to love? Find more great stuff at Create Link Inspire, Clever Chicks, Try a New Recipe, Fabulous, Show and Share, Hearth and Soul, What's Cooking, Wow Us, Wow Me, Full Plate. Stir salsa into cooked vegetables; spread over partially baked crust or flatbreads. Top with chicken and then cheese. Bake at 425 for 10 to 12 minutes or until crust is deep golden brown and cheese is melted. Cut into squares or slices. 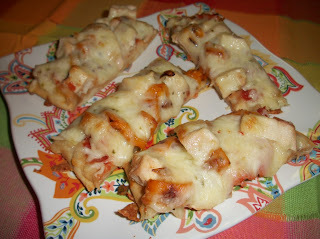 Sara, your Chicken Pepper Jack Flatbread looks fantastic! Hope you have a very special week and thanks so much for sharing with Full Plate Thursday.